Karin Hawelka of Care for Dogs offers a big Furry 'Thank You' to the HR team of the Mandarin Oriental Hotel Dhara Dhevi for their inspiring idea to raise funds during their Valentine's Party for their 400 employees by selling Care for Dogs T-shirts and other merchandise. 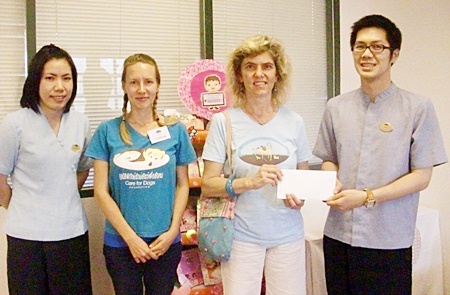 They did a great sales promotion and raised 16,730 baht for Care for Dogs. 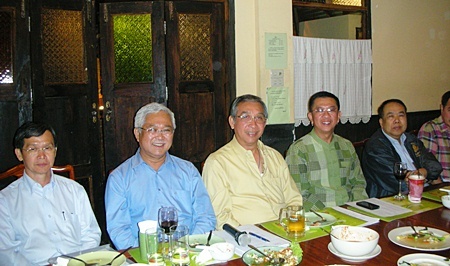 Chartchai Suthiklom, Director General of Corrections Department and President of Chiang Mai University Political Science and Public Administration Association chaired a committee meeting in preparation for the alumni home coming day in August 2011 at Ban Rommai restaurant. Attending the meeting were Boonlert Buranupakorn, President of Chiang Mai Provincial Administrative Organization and former Chiang Mai Governor Amornphan Nimanant and others. The Chiang Mai Zoo Aquarium and Playhouse Entertainment Complex joined hands for a special tour promotion package available from now until the end of 2011. The package allows visitors to see the Chiang Mai Zoo, the Aquarium, the Panda Display House and get the monorail service in the day zoo, and then view the spectacular show at the Playhouse at night. Seen here are James Nopparat of the Playhouse and Chiang Mai Zoo and Aquarium marketing officials. The newly appointed Inspector Director of Phuping Police Station, Pol Lt Chanya Moonmuang, left, paid a visit to the Chiang Mai Zoo. She paid a call on Nipon Wichairat, center, Assistant Director of the Zoo and also Chairman of the Police committee of Phuping Police Station.